I'm admittedly not in the Justin Bieber loop. Oh sure, I've heard of the pop singer; I know he's Canadian; and I even blogged about him back in March. Plus those Justin Bieber do's (don'ts?) have taken over the heads of many a young lad. Last week while boarding Pacific Coastal Airlines in BC's Powell River on the Sunshine Coast for my flight to Vancouver, I grabbed The Province for some quick reading on the 25-minute flight. Much to my surprise, JB was on the cover! Inside, there were a myriad of stories about the super star's descent upon Vancouver. 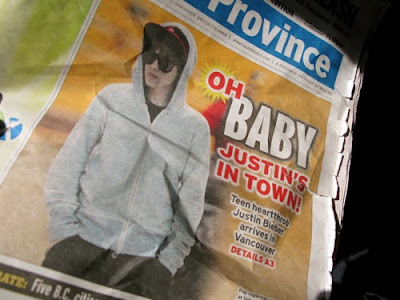 Bieber arrived from Tokyo on Oct. 14 at YVR (Vancouver International Airport), where a local paparazzi spotted him and undoubtedly sold his/her pics to the media. Justin Bieber is in concert Tuesday night, Oct 18 at Rogers Arena (formerly General Motors Place or GM Place). It looks like there are still tickets available, ranging from $127-$670 (US). A previous story in The Province is the one that really made my eyes roll: Justin Bieber Launching Line of Nail Polish ... no, really. Justin hair on the guys is one thing, but Justin nails? The OPI line is called One Less Lonely Girl, available exclusively at Walmart in December. OK, every generation has its teen idols. Mine just happened to be The Beatles.